currently riding '07 Norge, my first Guzzi. I enjoyed it the first year or so that I owned it but then I got a slip-on and new map from Mark (beetle) , now I kinda love it and may even keep it for a while, as long as my body can handle it. 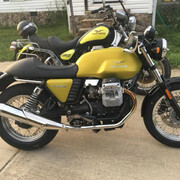 Just picked up my first Guzzi, a 2000 Jackal. Look forward to reading and learning. Riding a Vstrom now with 100,000 and very seriously considering a Guzzi next, V85 if it comes anywhere near what we are presently seeing. 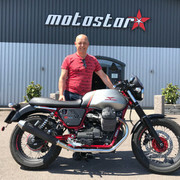 Was just at D2D and met KIWI ROY, we talked about Guzzi's and talked to a few others owners as well, one with a sidecar. The more Moto Guzzi folks I talk to the more I think they are the next bike for me. So I'm back again and will try to be more active. I'm on the wrong side of 55 (go away AARP, I'm not ready to admit that yet) and married with a great wife who rides with me. I have "a few" bikes (how many days are there???) one of which is a 2013 Stelvio that I am EXTREMELY pleased with and it is my wife's favorite bike to ride on. It's our long distance touring bike and frequent commuter when it gets it's turn making my ride back and forth to work the highlight of my day. I work in plastics manufacturing. We live in Camarillo, SoCal, which is about 1 hr north of the greater chaos they refer to as Los Angeles. There's a good chance I might be looking to trade/sell off one of the bikes for another Guzzi. I'm really lusting after a Tonti bike to park next to the Stelvio. I may "know" a few of you from other forums and hope to meet a few more on the road. The more Moto Guzzi folks I talk to the more I think they are the next bike for me. That's what got me into them! A different breed, and good to be associated with. Like Dan above I thought I had signed up here years ago but maybe it was just booze induced dream. Mostly post on ADVrider (as Lupin 3rd) and currently ride a Stelvio NTX, but that may change in the future since kid #2 is on his merry way and riding time now is mostly just commuting. Been a few interesting places though, so no complaining. Joining this forum though I am situated in G�teborg, Sweden! I sold my (old) Harley fxe -79 and bought myself a V7 II Racer -16 and I am very pleased with it! Not at all like riding the locomotive that an harley is! Welcome. I think you will find that Wildgoose Chase is a bit of an United Nations type of affair. Guzzi folk here come from all parts of the planet; I myself am situated on the backside of our planet down the bottom end. James here, 50, geo, based in Melbourne, Aussie. Bought a Nuovo Falcone Carabinieri four years ago and love it, after a 25 yr apprenticeship on Guzzi twins (V50, T5, 1100 Spat carbie, Cali Sp Sport). Have enjoyed this forum for a while, time I put in. Like many others here I was a member but do more reading than posting. Great group. I bought my 1974 Eldo in pieces back in the fall of 2005. On the road doing hack duty since the spring of '06. Last season my "solo" street bike was down for a month. (1972 Suzuki Hustler, inner crank seal ruptured; I did a full crankshaft rebuild). 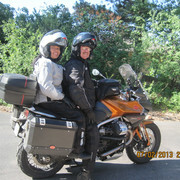 During this down time I was whining to my wife and she told me to quit complaining and take the sidecar off the Guzzi. This was supposed to be a temporary thing as we both enjoy the sidecar experience but I'm afraid I've really taken to the solo Eldo and am now hunting around for another rig. The Eldo will remain on two wheels. 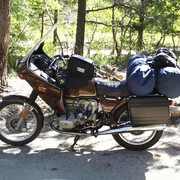 I also had a 1980 1000SP for a couple of seasons, (2007 and 8 I think it was). It was a great bike but I the riding I was doing didn't suit the long legged Spada. Its a bike that just isn't happy under 70 mph and that's well over my area's posted limits. Personally, I'm pushing hard on 60, (this October) and with no retirement in sight. I'm a licensed motorcycle tech at a Yamaha/Suzuki/KTM/Polaris/Mercury dealership in north eastern Ontario Canada. We are the largest motorcycle shop in our area but the majority of our business is ATV's, Side by sides, outboards and snowmobiles. I take some ribbing for riding old bikes, (my newest is a 1976) but after a day of fuel injection, ECU's, laptop computers I'm happy to ride home relying on carbs and points and condensers! Thanks to all who share their knowledge and experience here. Scott, here, from Bloomington Indiana. Always wanted a Moto-Guzzi, so I spend the last year casually hunting one down. Last month, I put in a bid on an eBay listing and ended up getting my offer when the top bidder backed out. Just picked it up this weekend and I've already put over 700 miles on it. Looking forward to many trips on it, but I know I'm going to need a lot of advice to keep it in good running condition. Matt- almost 50- VTC Manager- North Alabama. Had an account here a few years back. Bought a V7 Guzzi this past weekend at Sloan's. Bought the California 10 years ago in Holland from Peer. Loved the Triumphs but wanted something lighter in weight and easier to work on. Hello from John Risk, Edmonton, Alberta, 61 years old. Just purchased a used V7 ii loving it so far might have to get rid of a Honda or two. Bought my second Guzzi (30 years apart). Now down to just 2. 1200 sport 2008 last of the 2 valvers in red and white - love it!!!! Work for a living and to allow me to ride for fun. My name is Steve I moved from So Cal to backwoods Texas about a year ago. I bought a new 16 V7ii and put 26k on in one year. I enjoy woodworking and playing guitar. Im a truck driver for a biodiesel company. If anyone is near Decatur TX hit me up. Hello Steve , consider joining the GRIT FB page . Also , there are two rallies coming up not far from you , the GRIT rally near Lindale TX , and The Oklahoma camp out near Talihena OK . 1st and 2nd weekends in October . Come on and meet us . Bob. 68. Single. White. Male. Retired. Born in Detroit, I lived 40 years in the Denver area. My profession was working backstage for live shows. Stage Hand/Electrics/Technical Direction/Stage Manager/Production Management/Lighting Design. I have been traveling and living abroad since December 2013. The US via RV, and Mexico and Central America in a Jeep. I spent last year fixing up and living on a small sailboat in Florida. I am now researching possibly doing a tour of the UK and the European mainland as my last adventure before settling down somewhere. A late bloomer, I purchased my first bike at the age of 48. I have owned 2 BMW's, a KLR650, and a Honda ST1300 which I sold when I retired. Taken together I clocked 150,000 miles on those, hitting 44 of the lower 48 states, the western states multiple times. I am looking to buy my last bike, it will be a Moto Guzzi. I have always liked them, but I have never owned one. My name is Doug. I live in Old Forge, NY and am fortunate enough to have a winter escape home in Asheville, NC. After having experienced several bikes, Harley, BMW, Honda, CanAm, 'Zuki, I've finally seen the light... I own a 2015 Cali 1400 tour (in OF) and 2017 Cali 1400 Tour in (A'ville). I'm 68 years old, retired educator (High School, University), I worked at Brookhaven National Labratory and to pay the mortgage, I swung a hammer and remodeled bathrooms and kitchens. I hold a degree in Physics and a PHD in Test and Measurements...don't let that fool you, I'm really not a nerd...at least don't think so. 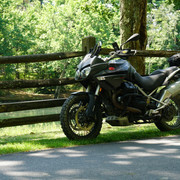 I'm always looking for someone to ride with in the Adirondacks or the Blue Ridge Mts. aspatuck@aol.com (yup, my kids will have to pry my AOL account out of my cold dead hands). A possum playing possum is no big deal. Find one that can play giraffe, now you got yourself something! My name is Clint Button. I bought my 73 V7 Sport in early '92, abandoned & in pieces with a stuck engine, for $200.00. Many, many bikes have come and gone- ducati 2 stroke, bevel & belt drive, parilla 250's, R96S, the first Benelli Quattro imported into the states, Sandcast Honda 1000042, Kawasaki W2's, HD's, on and on..- but the Guzzi is still here. Even got to ride it on TV in July, along with another Guzzi video if you scroll down... https://www.wspa.com/news/hometown-spotlight-antique-bikes-on-main/1327802512 I'm a full-time sculptor since 2000 and usually do more than lettering, but that's what was in studio when they did the video. Visit my website or YouTube channel if you're interested. Some pieces (souvenirs) on my V7 Sport came from Joe Tripoda of Moto Tripoda and Geno's House Of Triumph, both in New Orleans long ago when I was a chef. An old friend in Knoxville built the V7 Sport bottom end for me back in the late 90's and it's still running great. Giuliano Cecchinelli, one of my Master Sculptors, was thrilled when I first rode it to the studio in 2000 during my apprenticeship in VT, hence the favorite quote in my signature. I had been planning to do a custom tank and seat for the V7 Sport, because I wanted to and already had it. Then in July, I lucked into a 1967 V700 lump for $200.00 with plans to grab the SSI carbs and pieces and then get rid of the rest. Unloading it, I found the engine wasn't stuck so it's the next project & destined to be a period cafe bike, heavily influenced by Tonti's 1969 World Record bikes, to park next to my V7 Sport. Added wheels & brakes, starting on tank & seat mock-ups and modifying a spare frame. Probably will upgrade to new cylinders & heads along the way. A new friend from up north who is building a more accurate replica Record bike is helping with info and even a modified triple tree & cover. Very cool. Need a few small bits and will post both wanted ads & then a build thread as things progress & fortunes ebb and flow.... looks like there needs to be a hosting service used when posting pics? I like well-built but rider quality bikes that get used. This one will be no different. Hello Guzzistas (is that a faux pas as it could refer to another Guzzi forum? ). Gustavo from NW Oregon. My last Guzzi was a V50III, 1983 vintage. Sold it to get something sporty and fast (that was before I figured out fast had nothing to do with the bike, but I was young and didn't know any better...). It's been almost 30 years since I sold it and I'm back thinking about Guzzis (that new V85TT more specifically), so I am here to see what y'all have to say about these "modern" Guzzis. Here I am again....wondering what happened to myself?? Was a member for many years (as well as a donor) but drifted off about 6 years ago. Tried to log on but was told 'no usernames with that email address'. (I've had the same email for almost 20 years). Can find references to myself on archived threads, but I'm listed as a 'guest'. Anyway, 69 years old, Southern WI, many Guzzi's over the years, Monzas, Eldos, Lario. Just picked up a V65SP for a winter project.